Part Six! The Number of Man and Satan. What does the sixth commandment have to tell us that we don’t already know? As with the other commandments, this article will look at it in terms of the number Six, and the Hebrew Letter Vav. How complex is the commandment not to murder? VAV is the NAIL or Connector. SIX is also a symbol for man, beast or Satan. Why is Six a symbol for man? Genesis tells us that Man was created on the Sixth Day. It would make sense, then, that the Sixth Commandment is directly related to Man. It is first of the list on the second tablet. It relates to us without ambiguity. We cannot murder YHVH, but we can murder our fellow man. I have already covered how the first 4 commandments are instructions for how we relate to the Father, and the last 6 instruct us how we are to relate with our fellow man. We have crossed the fifth commandment ‘bridge’ that connects us with our Parents, our Patriarchs and our Father in Heaven. Now we deal squarely with the most important commandment with regard to our fellow man! The Vav is an interesting letter! It is a symbol of man. But it is also a connector between heaven and earth. It is important in Torah Scrolls. In Torah scrolls, the letter Vav appears at the beginning of every column. This was a rule that the scribes followed in order to ‘connect’ the writing to the scroll. The first Vav that appears in the Scriptures is in Genesis 1:1. It ‘connects’ heaven and earth in the Hebrew text, and suggests that there is a divine connection between the two! The theme in scriptures is all about unity! From the Shema, which declares that YHVH is One, to prophesies that declare the ‘two shall become one,’ we are told repeatedly that His plan is to re-gather His sheep into One Fold. How we treat each other is important to our Father. That Nail can be a connector to Him, or a nail in our coffin … or the coffin of those we murder! We can listen to our Father’s instructions, or be led astray by the enemy. DOES A NAIL (VAV) CONNECT OR KILL? The sixth commandment prohibiting murder is illustrated by the Vav: the Nail or Connector. 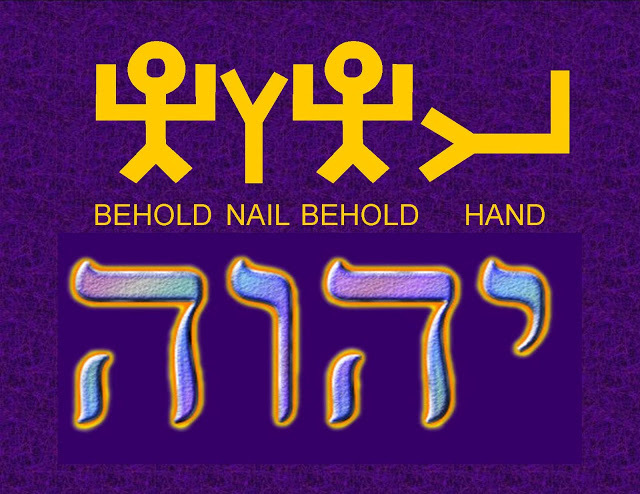 The Nail is the means by which our Messiah was murdered for teaching the Word of YHVH. It is an eternal reminder of His commandment not to murder. The Nail is also an eternal connection to the most significant event that ever happened in human history: that our Savior laid down His life in our place so that we might have eternal life with Him. The Vav is a hook and a nail. It connects us to YHVH and to his Word. It can be used to unite or as an instrument of death. In a literal sense the crucifixion nail was used to murder Yeshua! But that same nail connects Israel with the Father and with each other! How are we to understand this in connection with the sixth commandment not to murder? It is hard to imagine anything that would be a bigger ‘dis-connect’ than murder. It destroys unity as it destroys life! The division between men cannot be more profound than when one murders another. And, in fact, is profoundly illustrative of our lack of connection to the Creator of all men. WHAT DID YESHUA SAY ABOUT MURDER? But, he went on to say that division is more than murder! Mat 5:22 But I say to you that everyone who is angry with his brother will be liable to judgment; whoever insults his brother will be liable to the council; and whoever says, ‘You fool!’ will be liable to the hell of fire. Mar 7:20 And he said, “What comes out of a person is what defiles him. Mar 7:22 coveting, wickedness, deceit, sensuality, envy, slander, pride, foolishness. Yeshua expanded upon the theme of murder. He echoes what we read in Proverbs! Proverbs talks about Six things that YHVH hates! And seven is an abomination! It struck me when I was reading this that ‘he that soweth discord’ could very well be Satan, or at least the spirit of this world. Ha Satan has been working overtime to divide us from our brethren, from the Truth, and from YHVH. What is more of an abomination than that? But, in addition, if you look at the six things that YHVH ‘hates’ they all can work together to ‘sow discord’ among brethren. Pride, Lies, a Wicked and Mischievous Heart, Slander, Those who Shed innocent Blood, are all things that cause discord. Discord seems a mild word to describe the six things listed. Other translations use ‘quarrel’ or ‘strife’ instead of ‘discord.’ No matter how you slice it, these six things are characteristics of ‘men’ and go against the Father’s plan for unity between brothers. They can even lead to murder! HOW IS SIX THE NUMBER FOR SATAN? Six is also a symbol of Satan. He has power over the temporal things of this earth. He has been trying to murder the people of YHVH since he convinced Adam and Eve that they wouldn’t die if they disobeyed. In that sense, Satan is the original murderer, because he brought death into the world. And in a marvelous paradox, the Father who created all life sent His son to die to bring us all the hope for an escape from death! And not only an escape from Death, but the promise of Life with Him! And that ancient promise was brought closer to us when the Word of YHVH became flesh! John 1:14 The Word became flesh and lived among us. We gazed on his glory, the kind of glory that belongs to the Father’s unique Son, who is full of grace and truth. John 5:24 “Truly, I tell all of you with certainty, whoever hears what I say and believes in the one who sent me has eternal life and will not be judged, but has passed from death to life. WHO HAS DOMINION OVER THE EARTH? Satan was given dominion over the Earth when Adam abandoned his birthright for sin. Six days (or six thousand years) will Satan have a say. We look forward to the 7th ‘day’ when we will Rest in our Father’s Kingdom for His millennial reign. Rev 20:6 How blessed and holy are those who participate in the first resurrection! The second death has no power over them. They will be priests of God and the Messiah, and will rule with him for a thousand years. May we all be found worthy to be in His presence for eternity! HIDDEN SECRETS IN THE TEN COMMANDMENTS! I watched an interesting teaching the other day from the AlephBeta.org site. Rabbi Fohrman teaches on the hidden structure of the Ten Commandments. Part of the teaching illustrated how the two tablets each held five commandments and how they could be paired, almost like mirror images of each other, to show an over-arching principle between those paired commandments. For example, the First Commandment can be paired with the sixth commandment. The first commandment is “I am YHVH your Elohim, who brought you out of the land of Egypt, out of the abode of slavery.” The identity of YHVH is connected to his role as the one who saved us from Egypt. The bottom line is: Don’t forget who He is! Recognize your Creator! What does that have to do with being a mirror of the 6th commandment? As Rabbi Fohrman explains, the concept of murder is the result of someone trying to remove another from existence. Obviously, we cannot murder YHVH, but we can refuse to recognize Him. We can ignore Him, just as when we murder someone we ignore their right to life! The overarching principle between the first and sixth commandment could be stated as: Don’t do away with God or Man. Or in a positive sense: Recognize the Existence of YHVH and Man. In an even deeper level, if we do not recognize that there is a Creator named YHVH and that all of creation is His, we can easily move to the next step. If there is no YHVH, then our fellow man is not created in His image, and murder has no consequence. We, in essence, place ourselves as god, the one who gets to choose who lives and who dies. If we elevate ourselves above YHVH, we do not recognize His existence. If we can dare to elevate ourselves above the Creator, what hinders us from placing ourselves above another human being? There is another ‘connection’ that I will share, just because I love it! Obviously, since I am basing this study on the word-pictures in Hebrew, I believe that the Hebrew letters are actually comprised of word pictures. There are some surprising things that can be learned when we understand them. The following is a proof that our Creator had a plan from the beginning. The Vav is part of His name, and it tells us so much more than just what to call Him. This can never be discerned without a return to His Hebrew language. 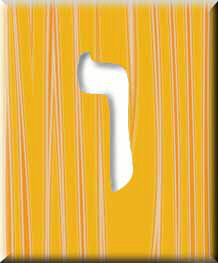 The Name, YHVH (Yod, Hey, Vav, Hey) can be read as words as well as a name. 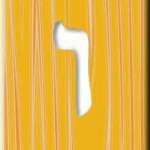 It is the Name of our Creator as He told it to Moses at the burning bush, and appears nearly seven thousand times in the Bible. The following is YHVH in both Paleo-Hebrew and modern Hebrew script. Remember that Hebrew is read from Right to Left. Hey is Behold or Reveal! 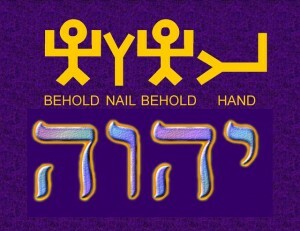 Read as a sentence, His Name is saying that the Right Hand of God (Yod), Reveals (Hey) the Nail (Vav) which Connects us to Revelation (Hey). In short: Behold the Hand; Behold the Nail. I also love the Paleo-Hebrew letters (the ones that are in yellow in the illustration). To me, it shows another picture of One New Man, or the Two Sticks who will become One. Hey looks like a praising man. Who praises YHVH? The Two Houses! Judah and Israel! The Right Hand of GOD will bring the House of Judah (Behold the Praising Man) and Connect them with the Nail to the House of Israel (Behold the Praising Man). When I look at it that way (just letting the pictures inform me) I see that His NAME is also His prophecy that the two Houses will be re-united as One. His NAME is, in fact, the Gospel of the Kingdom! Shema, Israel! YHVH is our Elohim, YHVH is One! How awesome is our Creator??!! Where do I find the first five (5) parts? This was so excellent! Thank you, Julia. Was just recently introduced to Bulldozer Faith – a real blessing!! I have added links to all the articles in this series. You may also find additional articles by utilizing the Search Option on the Left Sidebar under the Writer’s Corner. Thanks so much for bringing this to my attention and for your kind words! Shalom. i like this, because i was fallen but am back now.